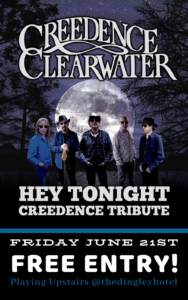 ‘HEY TONIGHT’ Creedence Clearwater Show takes you on a swamp rockin’ musical journey revisiting the golden years of C.C.R & the band’s renowned vocalist John Fogerty. Performing classic hits including Bad Moon Rising, Going Up Around The Bend, Proud Mary, Suzie Q, Green River, Born On The Bayou, Fortunate Son, Have You Ever Seen The Rain, Travelin’ Band, The Old Man Is Down The Road, Rock & Roll Girls and many more! The Dingley Bistro is open for pre-show drinks and dinner. For all bookings call 9551 8344.